Thermocouple temperature probes are bimetallic probes that are used in various temperature-sensing applications. They consist of two wires, each of which is made of a different metallic element or alloy. The wires are joined at one end to form a measuring junction that is exposed to the fluid or medium under measurement. The other end of the wire is terminated at a reference junction. Current flows through a circuit when the two junctions of thermocouple temperature probes are at different temperatures. The voltage resulting from this current flow is then measured to determine the temperature. Grounded thermocouples have a tip with wires that are physically attached to the inside of the probe wall. This results in good heat transfer from the outside, through the probe wall to the thermocouple junction. Exposed thermocouples have an exposed junction that protrudes from the tip of the sheath and extends into the surrounding environment. These thermocouple temperature probes provide the best response time, but are limited to only non-corrosive and non-pressurized applications. Base, noble, and refractory metal type is an important specification to consider when selecting thermocouple temperature probes. Lettered choices for thermocouple type include E, J, K, N, T, B, S, R, W, and C.
The element configuration for thermocouple temperature probes may be single, double, or more than two. Additional specifications for thermocouple temperature probes include diameter or width, sensitive length, and temperature range. 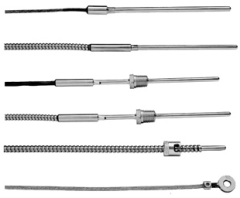 Parameters for thermocouple temperature probes include process connection and sensor termination type. Thermocouple temperature probes for specific applications are also available. RTD (resistive thermal device) temperature probes are types of thermal resistors which measure temperature as a function of resistance. Temperature probes are devices used to sense and measure temperature. Probe technology options include thermocouple, RTD, thermistor, and solid state types. Thermistor temperature probes sense temperature by using thermistors, devices made of semiconductor materials which exhibit a large change in resistance for a small change in temperature.